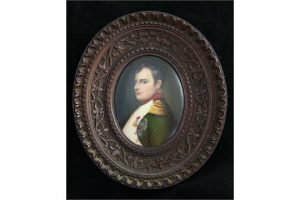 A Paris porcelain oval portrait plaque, late 19th century, painted with the figure of Napoleon Bonaparte, half length in uniform, in a carved walnut frame. 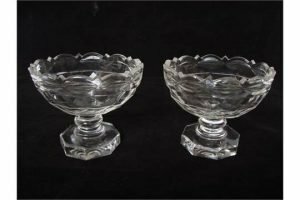 A pair of late 19th Century Regency style oval cut glass pedestal bon bon dishes, on octagonal bases. 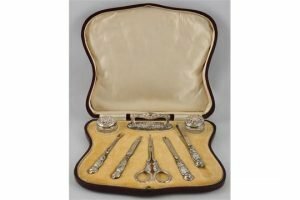 An Edwardian silver mounted, steel 8 piece manicure set, red Morocco cased, Birmingham 1907/08. 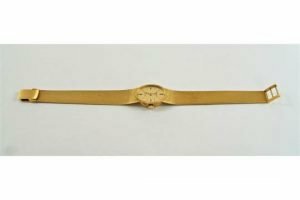 A Chopard lady’s bracelet watch, marked 750, the oval dial with batons to the quarters, to an integral Milanese bracelet. 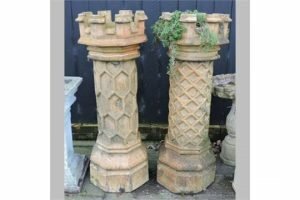 A near pair of castle top terracotta chimney pots, relief decorated with a trellis pattern. 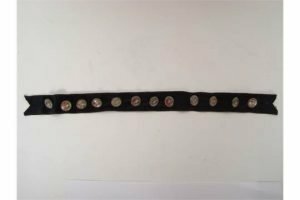 A set of twelve 19th Century white metal dress buttons, each containing an Indian miniature portrait of Mughal noblewoman on ivory under rock crystal. 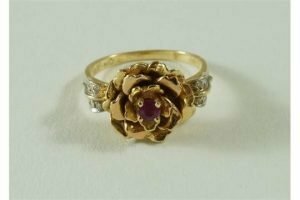 A 14 carat gold flower head ruby and diamond ring, the rose type flower centred with a ruby, with six small brilliant cuts to each shoulder. 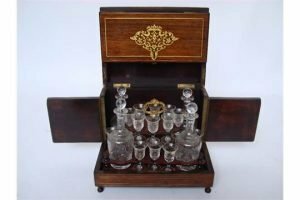 A mid 19th Century rosewood decanter box, the hinged lid and front strung and inlaid with central foliate cartouche, opening to reveal an interior with lift out decanter stand, with brass carrying handle containing four cut glass decanters and stoppers and sixteen liqueur glasses, on turned feet with key. 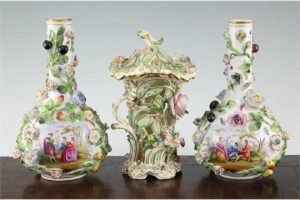 A pair of Potschappel bottle vases and a Derby pot pourri vase and cover, 19th century, the pair of Potschappel vases typically painted in Meissen style with figures in landscapes and encrusted with flowers, fruit and trailing leaves. 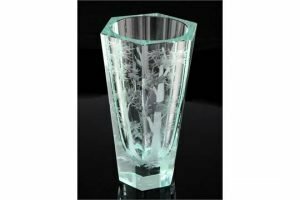 A Moser green tinted glass tapering hexagonal vase, wheel engraved with a pheasant in flight amid trees, etched Moser mark to base. 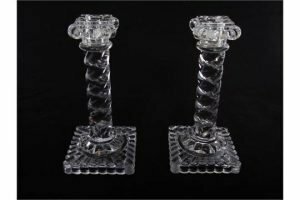 A pair of Baccarat crystal column candlesticks with scroll capitals and rope twist stems, moulded mark depose Baccarat. 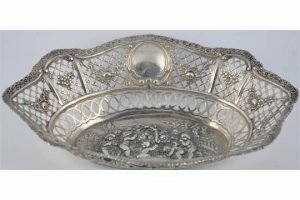 A Continental 800 standard silver fruit basket, embossed with cherubs, 10oz. 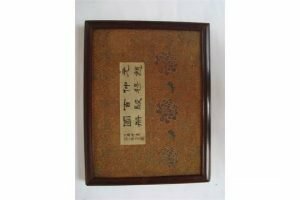 An early 20th Century Chinese folding book of watercolour paintings on silk. 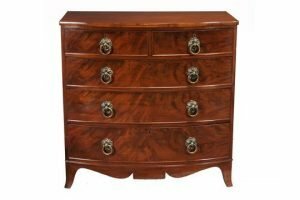 A Regency mahogany chest of drawers, circa 1815, of bow front outline, with two short and three long graduated drawers above shaped apron and outswept legs. 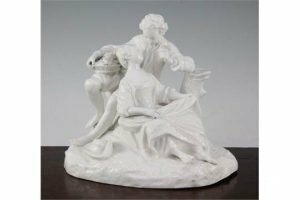 A Continental white glazed porcelain group of two lovers, late 19th century, he holding a rose and a basket of flowers and she seated by his feet on a rockwork base, pseudo crossed swords mark. 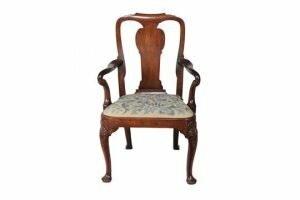 A George II walnut open armchair, circa 1740, the shaped top rail and vase splat above a drop-in seat covered in blue floral tapestry, on cabriole legs with shell knees to front terminating in pad feet. 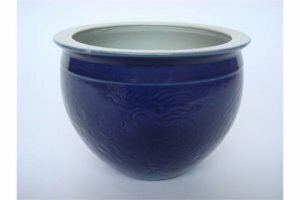 Chinese blue ground porcelain jardiniere, sgraffito decorated with a pair of dragons chasing the flaming pearl. 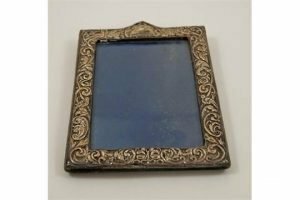 A silver photograph frame, Birmingham 1903, of rectangular outline. 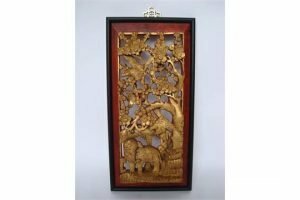 An early 20th Century Chinese giltwood and painted wall panel, deeply carved and pierced with an elephant and birds in the branches of a flowering prunus tree, red painted border, framed. 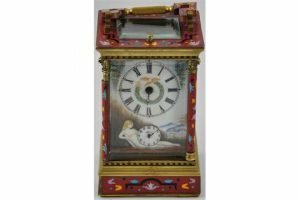 A brass and champleve enamel repeating carriage clock, the painted rectangular dial with alarm.